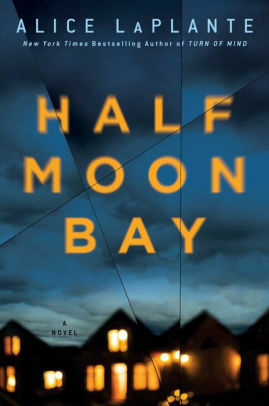 Half Moon Bay by Alice LaPlante is a so-so dark mystery/psychological study of a grieving mother. A year ago Jane O'Malley lost her teenage daughter, Angela, to a car accident. Ever since that day, Jane's grief has been overwhelming, all-encompassing, and consuming her every thought. Her marriage ended. In an effort to find some way to live her life, Jane, a botanist, has moved to the tiny seaside town of Half Moon Bay to work at Smithson’s Nursery with the native plants. Awkward handling interpersonal relationships and conversations, Jane is just trying to find her way through her grief. When the young girls start disappearing, though, Jane's loner ways and inept social skills put her on the police and FBI list of suspects. It doesn't help that Jane has no alibi for the time the girls disappear and for later, when their bodies are found. Her one, albeit weird and odd, obsessive need becomes her recent friendship with new residents, Alma Godwin and Edward Stanton, and her affair with Edward. But, as more information comes to light, Jane has been making bad decisions since her daughter's death. Can you trust her? I'm not a fan of the writing technique LaPlante utilizes in Half Moon Bay. The dialogue is italicized, and part of Jane's thoughts in a stream-of-consciousness style. The narrative is told through Jane's first person account but, because Jane is so consumed with grief, and has her thoughts stray all the time, this can make the narrative difficult to follow. While readers will feel sympathy for Jane, she is not a trustworthy or likeable character. Well, no one is in this dark, atmospheric psychological study (with the exception of Adam, a co-worker at the nursery). The ease in which Jane can be manipulated and seduced by Edward and Alma is annoying and disturbing. 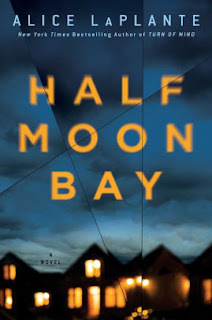 I've got to say that there is no great surprise about the plot or the ending of Half Moon Bay. Astute readers are going to know with certainty what direction the plot is going to take very early in the novel and will be correct.